The Picture of Dorian Gray is one of the great movies — about a young man who, after an off-hand wish, finds himself unaging, with age — and corruption — affecting his portrait, but he himself is apparently untouched. He is guided down the path of corruption and self-indulgence, and leads, directly or indirectly, to multiple deaths and suicides. Can he find salvation? In short, The Picture of Dorian Gray is an excellent movie, with an excellent cast. 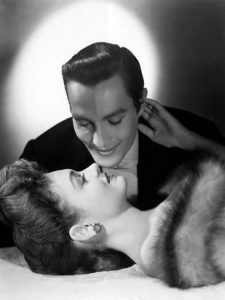 Hurd Hatfield stars at the title character, and plays Dorian Gray as aloof, and cold — at least after his Faustian bargain. George Sanders is at his best as Lord Henry Wotton, who prods, leads and pushes Dorian into temptation, excess, and self-indulgence. It’s a delight to watch Sanders at his wicked best, corrupting Dorian Gray at every opportunity. 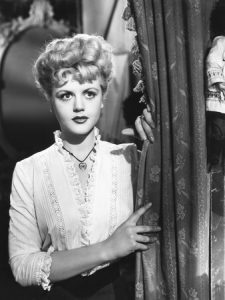 A young Angela Lansbury is the innocent singer, with a great voice, who Gray (at Wooton’s urging) pushes away from him — leading to her death by suicide. A young Donna Reed plays the part of the young woman who, initially smitten as a young girl with Dorian, pursues him as a young woman — much to the chagrin of her boyfriend David Stone (a young Peter Lawford). Dorian Gray sinks deeper into self-pleasure, only to become less happy. He goes as far as murder to try and hide the secret of his painting — in a great scene, where the man who painted the portrait tries — and fails — to remind him of his youth and to have him repent, and pray for forgiveness. Dorian murders him for his kindness and then blackmails another man to cover it up. At the finale, Dorian is given a final chance to repent … I’ll not give away the ending, except to say that it’s excellent, with the horrific ending that you would expect in a monster movie. I truly enjoyed The Picture of Dorian Gray and recommend it very highly. Lord Henry Wotton (George Sanders): If I could get back my youth, I’d do anything in the world except get up early, take exercise or be respectable. Lord Henry Wotton (George Sanders): I apologize for the intelligence of my remarks, Sir Thomas, I’d forgotten that you were a member of Parliament. Lord Henry Wotton (George Sanders): I like persons better than principles and persons with no principles better than anything at all. Dorian Gray: If only it was the picture who was to grow old, and I remain young. There’s nothing in the world I wouldn’t give for that. Yes, I would give even my soul for it. Lord Henry Wotton (George Sanders): I’m analyzing women at present. The subject is less difficult than I was led to believe. Women represent the triumph of matter over mind, just as men represent the triumph of mind over morals. Lord Henry Wotton (George Sanders): There’s only one way to get rid of temptation, and that’s to yield to it. Lord Henry Wotton (George Sanders): I suppose in a fortnight or so, we shall be told he’s been seen in San Francisco. It’s an odd thing, but everyone who disappears is said to be seen in San Francisco. It must be a delightful city and possess all the attractions of the next world. Dorian Gray (Hurd Hatfield): Wait. You must not look at it. Basil Hallward: [about to uncover his painting] Not look at my own work? You’re not serious. Why shouldn’t I look at it? Dorian Gray (Hurd Hatfield): I don’t offer any explanation and do not ask for any. But if you try to look at that picture, Basil, on my word of honor, I will never speak to you again. Basil Hallward: What on earth is the matter with you? Basil Hallward: [having seen Dorian’s corrupted portrait] But this is monstrous. It’s beyond nature, beyond reason. What does it mean? Dorian Gray (Hurd Hatfield): On the day you finished this painting, I made a wish. Perhaps you would call it a prayer. My wish was granted. Basil Hallward: But you told me you had destroyed my painting. Dorian Gray (Hurd Hatfield): I was wrong. It has destroyed me. Basil Hallward: It has the eyes of the Devil! Dorian Gray (Hurd Hatfield): Each of us has heaven and hell in him. Basil Hallward: If this is true… if this is what you’ve done with your life, it is far worse than anything that’s being said of you. Do you know how to pray, Dorian? Lord Henry Wotton (George Sanders): What is it that has really happened? Someone has killed herself who loved you. I wish I had had such an experience. The women who have admired me, and there have been some, have always insisted on living long after I’ve ceased to care for them or them for me. Lord Henry Wotton (George Sanders): No civilized man ever regrets a pleasure, and no uncivilized man ever knows what a pleasure is. Lord Henry Wotton (George Sanders): One of the great secrets of life. Most people die of a sort of creeping common sense and discover too late that the only things one never regrets are one’s mistakes. Lord Henry Wotton (George Sanders): But adoring someone is certainly better than being adored. Being adored is a nuisance. You’ll discover, Dorian, that women treat us just as humanity treats its gods. They worship us and keep bothering us to do something for them. Sir Thomas: You must admit that women give men the very gold of their lives. Lord Henry Wotton (George Sanders): But they invariably want it back in such small change. Women, as a witty Frenchman put it, inspire us with the desire to do masterpieces and always prevent us from carrying them out. David Stone (Peter Lawford): [Referring to Dorian’s shuttered room] What rare things have you stored away there, Dorian? Dorian Gray (Hurd Hatfield): Skeletons of inquisitive guests. Sibyl Vane (Angela Lansbury): [Listening to Dorian play the piano] It’s wonderful. Did… did you write it? Dorian Gray (Hurd Hatfield): Fredric Chopin wrote it… for a woman he loved. Her name was George Sand. Someday I’ll tell you about it. Sibyl Vane (Angela Lansbury): I should like that. Dorian Gray (Hurd Hatfield): [Playing a couple of notes] What does the music mean to you? Sibyl Vane (Angela Lansbury): I don’t know. It’s full of emotion… but it’s not happy. Dorian Gray (Hurd Hatfield): No, it’s not happy. Sibyl Vane (Angela Lansbury): Why was he unhappy? Dorian Gray (Hurd Hatfield): [Playing a couple of notes] Perhaps because he felt his youth slipping away from him. Sibyl Vane (Angela Lansbury): What an odd thing for you to say. Dorian Gray (Hurd Hatfield): Why? Sibyl Vane (Angela Lansbury): You’re so young. Dorian Gray (Hurd Hatfield): Yes. And you also. Sibyl Vane (Angela Lansbury): What is the music called. Has it a name? Dorian Gray (Hurd Hatfield): Kind of name. It’s called… Prelude. Lord Henry Wotton (George Sanders): I choose my friends carefully. Dorian Gray (Hurd Hatfield): You think it’s only God who sees the soul. 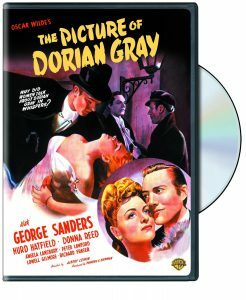 The movie is black and white except for four times when Dorian Gray’s picture is shown in color. Years later, a friend of Hurd Hatfield’s bought the Henrique Medina painting of young Dorian Gray that was used in the movie at the MGM auction, and gave it to Hatfield. On March 21, 2015 the portrait was put up for auction at Christie’s in New York (from the Collection of Robert Hatfield Ellsworth) with a pre-auction estimate of between $5,000 to $8.000. It sold for $149,000. Ivan Le Lorraine Albright’s famous painting of the decayed Dorian Gray – which took approximately one year to complete – is now owned by the Art Institute of Chicago, where it has been on display for many years. Albright’s twin brother Malvin Albright, better known as a sculptor, was also commissioned to create a painting of the young Dorian for the film, although his work went unused. Henrique Medina did the portrait seen in the film. The March 27, 1944 issue of Life magazine included a story and photos of the brothers working on their paintings for the film. According to Angela Lansbury, a friend of hers, Michael Dyne, was considered for Dorian. Dyne suggested Lansbury for the role of Sybil Vane. The casting director liked her for the part and suggested her to George Cukor for Gaslight (1944). She saw both Cukor and Albert Lewin the same day and was cast for her first two films. Donna Reed didn’t enjoy making this movie because she was promised the role played by Angela Lansbury. The blocks under the table in Dorian’s school room have the initials of the people who die.